Influences: Trip Shakespeare, David Wilcox, Jeff Buckley, Joni Mitchell, Housemartins, Lyle Lovett, Kurt Vonnegut, BNL, Shawn Colvin, M. Ward, Anne Lamott, Jackson Browne, Rev. Al Green, Paul Simon, Aretha Franklin, Shawn Kirchner, Martin Sexton, Elmore Leonard, XTC, Jonatha Brooke, Greg Brown, Don Chaffer, Iron & Wine, Bob Schneider, Wilco, Dr.Dog, punctuation, TC Elliott, Das Binky, SWG, Nancy Rost, cowex, Dethklok, hoopshank and you! I'll be here in 2019, losing sleep and numbing my ears and fingertips. Not sure about collabs yet, so I'll take a tentative approach until we get into it. My apologies if I haven't managed to listen to your songs yet. It's not you, it's me. I'm twisting tightly this month and trying to figure out how to work it out. Ack. Fawm on! I appreciate you. Thanks for your very positive feedback on my collaboration "Expectations"
Thanks for the nice feedback! Added you to my watchlist to give a listen to! Cheers! Great and helpful feedback on "Suicide City." Thanks! Sorry we had to bug out a bit early Friday - a sudden family emergency (that's ok now). Really enjoyed what we heard in the first half! If you wouldn't mind sharing, do you have Missoula anywhere on line? Would also love to know the chord progressions (how you play them) if possible. I'm kind of stuck in the 4 chord progression on my songs and need just a little help breaking out of that! No worries if that's too difficult! Thanks, John! Hannah gives 3 active kids and a new position as director of worship arts at Blackhawk as an excuse for not doing FAWM this year, but I'm not buying it😏! She's a busy gal, but I do miss her wonderful, insightful tunes! I'm so bummed I won't be able to come Fri to see you three. That would have been a treat. Will try for the FOP! Thanks for the info. Hey John! Thanks for listening and all the nice comments - they mean loads! 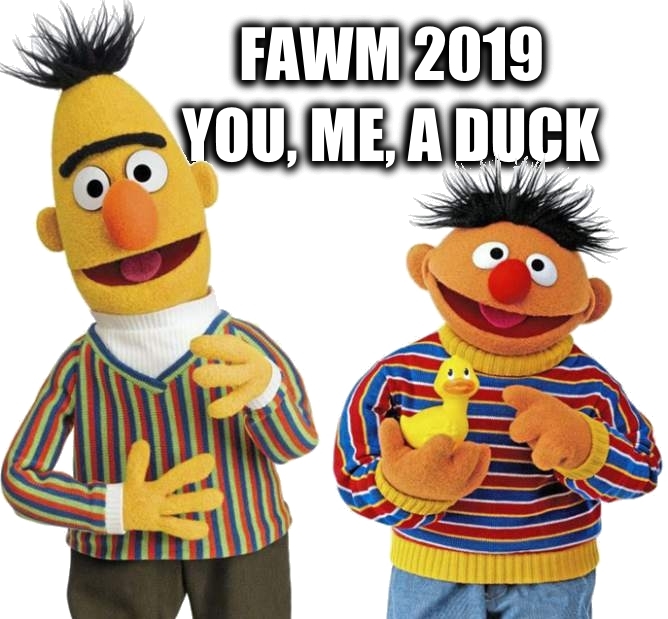 As always, have so enjoyed your contributions to FAWM this year, and congratulations on your prolific-ness! You know, I have to admit I don't always understand your lyrics (sometimes feel like I'm missing the joke😏 - could be my ignorance of current pop culture), but I always find them interesting, and am in awe of your musicality and great harmonies! Would love to see you at another local gig sometime. Anything coming up in the future? Missed our friend Hannah B this year. Hey John! Thanks for listening and all the nice comments - they mean loads! As always, have so enjoyed your contributions to FAWM this year, and congratulations on your prolific-ness! You know, I have to admit I don't always understand your lyrics (sometimes feel like I'm missing the joke😏 - could be my unfamiliarity of much of current pop culture), but I always find them interesting, and am in awe of your musicality and great harmonies! Would love to see you at another local gig sometime. Anything coming up in the future? Missed our friend Hannah B this year. I'm real happy with "Gifts." Songs are sometimes coming out exactly as I envisioned, which is fun. And happy 16 to you!! DUDE! Congrats on hitting the sweet 16 this year! does that mean you didn’t like it? Love love love it! Please feel free to post!!!! A thousand thanks! Thanks for the detailed commentary on "Falling Stars." I really appreciate the help. I am inclined to Zero Sum, though the line "it won't be won" isn't exactly accurate since Zero Sum simply means it's won at the opponent's expense. Still, my theme last year was that conflicts won at someone else's expense aren't truly won. I wonder if that can be communicated in so few words. I agree with you on the Chorus needing to get bigger. That was what I was feeling. Chorus 2 was bigger than Ch1, but I still felt like it needed just a bit more growth. Thanks again! I would LOVE that John!!! You would be perfect and I would be honored! I think it would be a great fit. but if nothing comes to mind, it’s all good. Hi John, heard you on the Calum radio show and you sounded great. Thanks muchly for the goofy comment on my goofy song. Thank you so much for the comment on Carry Me Home! Glad you enjoyed it! Guten tag, mein Herr. Wie gehts? Glückliche Schreiben. Thanks for heads up, no worries about it taking time. I've been ill from day 2 of fawm so taking your time worked out well for me. Hi John! Thanks for finding me and commenting - looking forward to FAWMing with everyone!! Hey, thanks a lot! Won't have as much time this year but hopefully I'll get a least a few songs done. Wishing you a great FAWM! Thanks so much for your support these past two years, @johncrossman. In reading the many posts you have on your wall thus far, clearly I’m not the only recipient of your kind encouragement! Nice to see you another year! Happy FAWMing! I know, right? It feels a bit like going to the dark side. Oh, is it that time of year already? I’ll be around. Not feeling very into it right now but we’ll see what happens 😀. Please do an #alterego song as Bird Bro & The Crew Gets Weird. Always a pleasure to see you here! re: Firm Grape - Is that our new band name? Or maybe just a song title? Or possible nothing other than a conversation starter that *hopefully* leads to a collab? I'll take it. FAWM. Madison. Perfect February, don’t you think? Ahh, Crossman - so good to see you're back for more FAWMtastic action! Your presence at FAWM is one of the few rock solid things that can be depended on. I bask in your consistency... lead us! JOHNNNNNNNN!!!!!! I want to just have a FAWMSTOCK...with YOU!! So much work. So little shmork. Numb ears are a definite FAWM symptom for me too. I hear mixing at low volume is a great thing since it forces you to really exercise compressors and eq... That's advice I'm terrible at following. Heya, JX. I'm down with tentative approaches. Excited to FAWM and post-FAWM (gig) with you!